The most important promise you keep is the promise you made to yourself. How often do we promise ourselves we’re going to change something, or do something differently, or improve our health, or finish what we started, or finally reach for our dreams—only to be the first victim of a broken promise? Stop making promises to yourself you don’t keep! Make less promises. Make more realistic promises. Start small. Do whatever you have to do. Just keep your word to yourself. 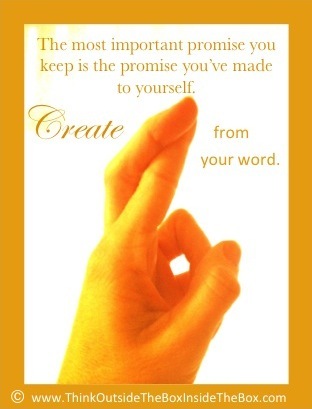 When you create from what you have, you need to be able to count on your word.